If you aren’t already following the Honda Japan on YouTube, you really ought to be, because they occasionally post some nifty little videos from the Honda Collection Hall museum. The videos often feature an obscure Honda ride—like the Zook here—that you may not have even heard of. While all of this is clearly going down in Japan, there isn’t any dialogue, so you don’t even need to know the language. Hondas speak the language of brap. The Zook is a personal mobility device that looks like a bar stool stapled to a skate board with a 50cc two-stroke motor somehow wedged under it. Clearly a product of the ‘90s, the Zook is absolutely resplendent in the best shade of teal possible. 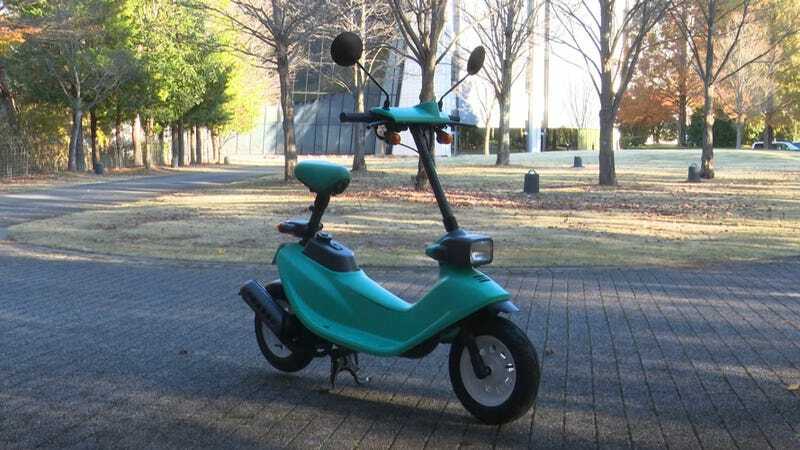 It was only available in Japan, and was marketed toward trendy young riders for zipping around the city. More than anything, it was intended to be inexpensive, selling for the equivalent of about $650 US dollars in 1990. With a brief walk-around, some ride-by shots, and a POV segment, the video is short and sweet, introducing you to something cool and new. I really want to import one to ride around during Radwood. Who wants to help me?